This Is The Easiest Way To Support A Charity. Thrift Shops are not only good for deals. It is an excellent way for you to support a charity. Most of the workers are voluntary workers. This is very good news, because it helps to keep the prices low. If you have a few free hours available, why not offer your services? It is a great way to give back to your community, and the environment. I want all you thrift shop users to share with us the best thrift Shops in your area. This will help single parents and bargain hunters like me to easily locate them. We also need to know when the shops are having a sale. Come on bargain hunters, let's do this for a good cause. I have introduced so many people to go to the thrift shops and they all love the deal they got. Try it for yourself, you will love it. It is fun when you go home and throw all your goodies (deals) on the living room floor and sort them through. Most thrift shops have an exchange only policy. This allows you to return an item if need be. Another good place to pick up deals and support a charity is at a garage sale. 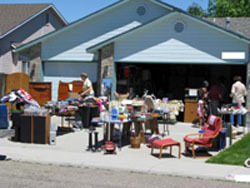 A garage sale is also known as a yard sale, spring-cleaning sale, or moving sale. A garage sale is an informal irregularly scheduled sale event by private individuals. Sellers are not required to obtain a business license or collect sales tax for goods sold. You can pick up a lot of good deals at a garage sale. The same advice for thrift shops goes to the garage sales. You have to go to "ritzy" areas to get quality items at bargain prices. There will be signs posted in the area with directions a few days before the actual sale. Some people advertise the sale in the local newspaper, flyers, or sometimes the local television stations will broadcast a sale on the local public channel. Some garage sales are held by charitable organizations, and the money raised goes to charity. The typical goods in a garage sale are the following items: household knick-knacks from the homeowner conducting the sale, clothes, toys, books, lawn and garden tools sports equipments, bicycles and board games. Larger items like furniture and appliances are not uncommon at garage sale. The seller, who is the charitable organization or the homeowner, displays the goods to passerby or those responding to signs. Buyers who arrive before the hours of the sale to review the items are known as "early birds"; they often are professional restorers or resellers. 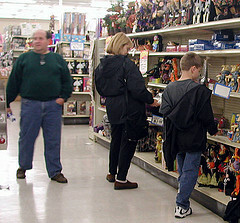 Such sales also attract collectors, who are searching for bargains or for rare and unusual items. Haggling and bargaining is routine at garage sales. So, bargain shoppers, be a early bird and get your bargain on. Don't let the collectors get there before you do. Tips: Seniors always get an extra percentage off on all items at most thrift shops. There are days when some thrift shops have a sale of up to 50% off all items in the store.